July 11, 2013 Daniel G.
Buyers’ market, sellers’ market, and balanced market are real estate terms that are used to define month’s supply of inventory (MSI) with regard to who has the advantage in a sales transaction. This number is based on the current number of homes for sale in a given market and the past absorption rate. Typically, a seller’s market offers buyers 0-4 month’s supply of inventory. The seller has the advantage in this situation because there are fewer homes for sale than there are buyers looking for them. The increased demand with lower inventory levels leads to shorter list time, multiple offers, and, in many cases, homes selling above list price. A buyer’s market is the opposite. There are more homes for sale than there are buyers looking for them. This decreased demand with higher inventory levels leads to longer list time, fewer and often lower-priced offers, and price reductions. In this scenario, the buyer has the advantage. Any MSI over 6 months in considered a buyer’s market. 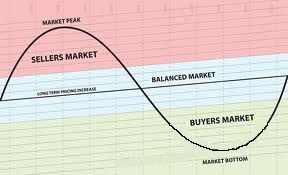 A balanced market is considered a healthy market with a 4-6 month’s supply of inventory. Neither the buyer nor the seller is considered to have an advantage over another in a balanced market. Now let’s apply these terms to the Silicon Valley real estate market which is rivaled only by Los Angeles, New York, Chicago, Boston, and parts of Florida. Following the above ranges for market distinctions, of all the cities from Burlingame down to San Jose, Atherton and Hillsborough are the only cities that fall into the balanced market segment1. The $3M+ price tag is the most likely reason that these two cities are considered balanced though their MSI averages just 4.15. All other cities are considered seller’s markets with MSI ranging from a staggering low 0.5 to 3.8, with a median of one month’s supply of inventory, and average prices ranging from $744,500 to $3,229,000. While Silicon Valley is typically a seller’s market, we have experienced two buyer’s markets since 2000 – 2001/2002 during the dot com bust and 2008-2011 at the beginning of the Great Recession. In both cases, the buyer’s market turned into a seller’s market almost overnight with dropping inventory levels and pent up demand exploding as Bay Area companies reached new levels of success and employees regained affluence. The current seller’s market has shaped buyer’s behavior tremendously. Most homes are going for an average of 10% over asking price in multiple offer situations, and the number of cash buyers has increased to upwards of 20%. In an effort to remain competitive with cash buyers, buyers with financing are waiving 100% of their contingencies and taking on more risk. This means that if their financing falls through they lose their entire deposit (which isn’t chump change when we are talking about a deposit on a $1M home). The Silicon Valley real estate market is a wild ride with a multitude of payoffs including a great location, lovely weather, and beautiful scenery surrounded by cutting edge industry. And remember, they aren’t making any more land in the Bay Area, so a seller’s market is here to stay for the foreseeable future. 1 Statistics are based on May 2013 data.